Make yourself comfortable at our Home2 Suites by Hilton Orlando South Park. Conveniently located 10 miles from Orlando International Airport our brand-new extended stay hotel is just minutes from the Orange County Convention Center local businesses and all Orlando*s major attractions including Universal Orlando Sea World and Aquatica SeaWorld*s Waterpark. Various restaurants and shopping centers are close by including The Florida Mall. We are nestled in the neighborhood of terrific companies including Houghton Mifflin Harcourt Expedia Strayer University and Darden. We also offer complimentary parking. Settle into a fresh and modern suite with plenty of space to work and relax. There*s a Working Wall* of storage areas and desk space and the living area has movable furniture to arrange as you like. 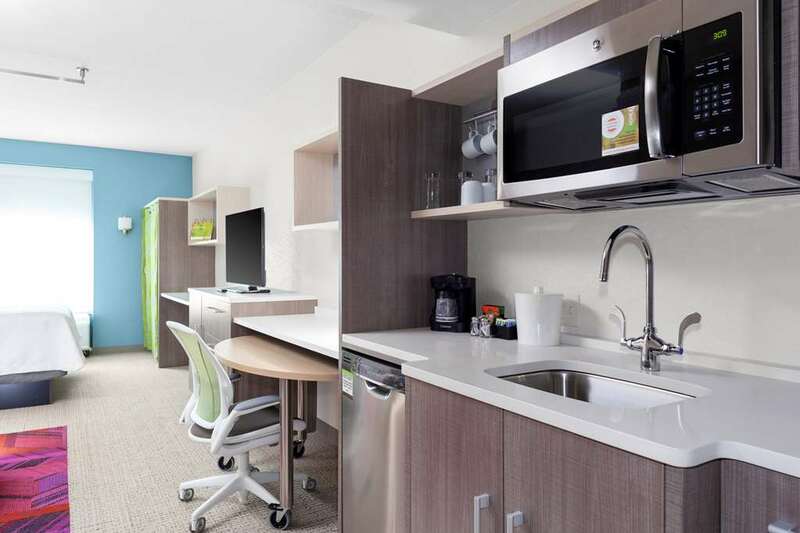 Suites also have a full kitchen with a dishwasher refrigerator/freezer microwave cookware plates cups and utensils. Connect devices to free WiFi and kick back on the sofa watching the 42-inch HDTV. Bring the bowls and leash Home2 is your pet*s home too. Start your day with our free continental breakfast. We have snack and drink cravings covered with our Home2 MKT shop open 24 hours. Take a dip in the outdoor pool or cook up something tasty for the family on our outdoor grill. Visit our unique Spin2 Cycle fitness/laundry facility where guests can wash clothes while working out. Counter-serve chain that offers health-oriented sandwiches salads soups - smoothies. Traditional Chinese specialties plus dim-sum service offered in casual yet relaxing environs. Down-to-earth chain offering American standards like burgers - ribs plus signature cocktails.